Arthur "Art" Blakey (October 11, 1919 ? October 16, 1990), also known as Abdullah Ibn Buhaina, was an American jazz drummer and bandleader. Along with Kenny Clarke and Max Roach, he was one of the inventors of the modern bebop style of drumming. He is known as a powerful musician and a vital groover; his brand of bluesy, funky hard bop was and continues to be profoundly influential on mainstream jazz. Along with Kenny Clarke and Max Roach, he was one of the inventors of the modern bebop style of drumming. He is known as a powerful musician and a vital groover; his brand of bluesy, funky hard bop was and continues to be profoundly influential on mainstream jazz. For more than 30 years his band the Jazz Messengers included many young musicians who went on to become prominent names in jazz. The band's legacy is thus not only known for the often exceptionally fine music it produced, but as a proving ground for several generations of jazz musicians; Blakey's groups are matched only by those of Miles Davis in this regard. He was a member of the Ahmadiyya Muslim Community. 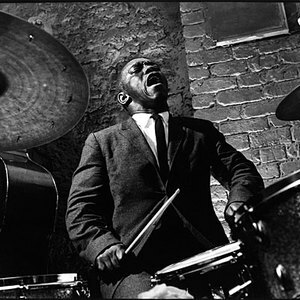 Legendary jazz drummer Art Blakey (1919-1990) is best known for the band he led, known as Art Blakey & The Jazz Messengers, which over the course of thirty years included some of the most prominent jazz musicians of the day -- including Clifford Brown, Wayne Shorter, Lee Morgan, Wynton Marsalis and Branford Marsalis. Blakey was born in Pittsburgh, Pennsylvania. By the time he was a teenager he was playing the piano full-time, leading a commercial band. Shortly afterwards, he taught himself to play the drums in the aggressive swing style of Chick Webb, Sid Catlett and Ray Bauduc. He joined Mary Lou Williams as a drummer for an engagement in New York in autumn 1942. He then toured with the Fletcher Henderson Orchestra (1943?4). During his years with Billy Eckstine's big band (1944?7) Blakey became associated with the modern-jazz movement, along with his fellow band members Miles Davis, Dexter Gordon, Fats Navarro and others. From his earliest recording sessions with Eckstine, and particularly in his historic sessions with Monk in 1947, Blakey exuded power and originality, creating a dark cymbal sound punctuated by frequent loud snare- and bass-drum accents in triplets or cross-rhythms. Although Blakey discouraged comparison of his own music with African drumming, he adopted several African devices after his visit in 1948?9, including rapping on the side of the drum and using his elbow on the tom-tom to alter the pitch. His much-imitated trademark, the forceful closing of the hi-hat on every second and fourth beat, was part of his style from 1950 to '51. A loud and domineering drummer, Blakey also listened and responded to his soloists. His contribution to jazz as a discoverer and molder of young talent over three decades was no less significant than his very considerable innovations on his instrument. In the 1940s, Blakey was a member of bands led by Mary Lou Williams, Fletcher Henderson, and Billy Eckstine. He converted to Islam during a visit to West Africa in the late 1940s and took the name Abdullah Ibn Buhaina (which led to the nickname "Bu"). By the late forties and early fifties, Blakey was backing musicians such as Miles Davis, Bud Powell and Thelonious Monk ? he is often considered to have been Monk's most empathetic drummer, and he played on both Monk's first recording session as a leader (for Blue Note Records in 1947) and his final one (in London in 1971), as well as many in between. Up to the 1960s Blakey also recorded as a sideman with many other musicians: Jimmy Smith, Herbie Nichols, Cannonball Adderley, Grant Green, and Jazz Messengers graduates Lee Morgan and Hank Mobley, amongst many others. However, after the mid-1960s he mostly concentrated on his own work as a leader. The origins of the Messengers are in a series of groups led or co-led by Blakey and pianist Horace Silver, though the name was not used on the earliest of their recordings. The most celebrated of these early records (credited to "The Art Blakey Quintet"), is A Night at Birdland from February 1954, one of the earliest commercially released "live" jazz records. This featured Silver, Blakey, the young trumpeter Clifford Brown, alto saxophonist Lou Donaldson and bassist Curly Russell. The "Jazz Messengers" name was first used on a 1954 recording nominally led by Silver, with Blakey, Hank Mobley, Kenny Dorham and Doug Watkins ? the same quintet would record The Jazz Messengers at the Cafe Bohemia the following year, still as a collective. Donald Byrd replaced Dorham, and the group recorded an album called simply The Jazz Messengers for Columbia Records in 1956. Blakey took over the group name when Silver left after the band's first year (taking Mobley, Byrd and Watkins with him to form a new quintet with a variety of drummers), and the band was known as "Art Blakey and the Jazz Messengers" from then onwards. Blakey went on to record dozens of albums with a constantly changing group of Jazz Messengers ? he had a policy of encouraging young musicians: as he remarked on-mike on A Night at Birdland (1954): "I'm gonna stay with the youngsters. When these get too old I'll get some younger ones. Keeps the mind active." After weathering the fusion era in the 1970s with some difficulty (recordings from this period are less plentiful and include attempts to incorporate instruments like electric piano), Blakey's band got revitalized in the early 1980s with the advent of neotraditionalist jazz. Wynton Marsalis was for a time the band's trumpeter and musical director, and even after Marsalis's departure Blakey's band continued as a proving ground for many "Young Lions" like Terence Blanchard, Donald Harrison and Kenny Garrett. Blakey continued performing and touring with the group into the late 1980s, and he died in 1990 of lung cancer in New York City, leaving behind a vast legacy and approach to jazz which is still the model for countless hard-bop players.